there is an awakening in my soul that has been happening for the past few years. an empowerment, a new guidance system, a new set of eyes. this new path that i decided to journey on has been one of self discovery and wanting to know more about the foundations in which i believe. when i step out into nature there is a grounding in my soul. connecting with my source, my world, my feelings. i have always been a nature girl and loved being outdoors hiking or going for long walks. this time something is different. i feel a communion. i feel a connection more intense. i feel the world differently. the flowers are more beautiful, and the sky just seems to sing. this morning i was given a special gift. 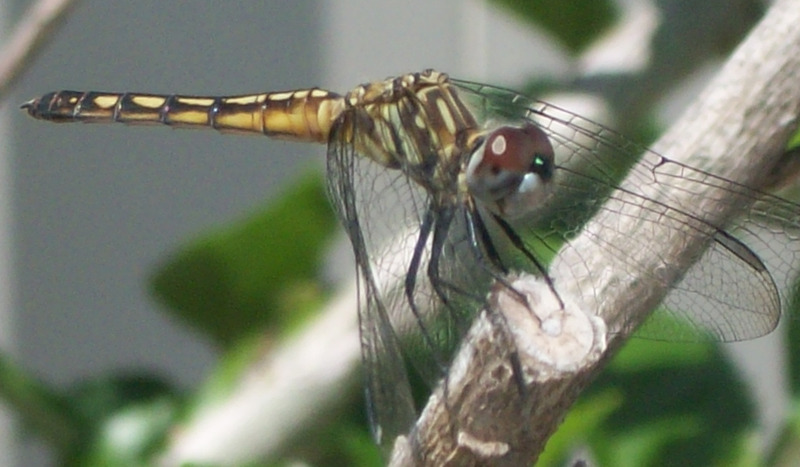 i was out taking some photos on my walk and there was this little dragonfly. he flew around us for a little bit and then landed on a nearby branch. he stayed there as if he was watching us. wanting to have a little chat and see how things were going with us. the kind creature stopped for some photos and allowed me to get very close and personal. i thought to myself — why is he not scared of me? he hung out with us for a decent amount of time. it was incredible to meet him and see his beautiful body up close. i was open this morning, finally recharged and let go of my stuff in my head. i was able to see the world through a new set of eyes. now if i can just stay on this path and not stray again i would be in super shape. here is a photo of this amazingly beautiful creature.